This week I got my inspiration from TWIYA's interview with Claire Legrand. The interview is mostly talking about her inspiration behind her latest novel, The Cavendish Home for Boys and Girls, and also a sneek peak into her upcoming novel, The Year of Shadows. I have heard of this novel before the interview with Claire, and only heard great things, but after watching the interview I am even more intrigued to read the novel. I think the number one thing that really got me wanting to read it is Claire's inspiration behind the novel of the orphanage she used to live by. It is the very first question they ask her so even if you only have a couple minutes go watch the interview to at least hear her inspiration behind the story. I really think this is going to be a novel that I fall in love with and will rave about when I finally read it. The cover alone I adore, because it has that old-timey feel to it and the novel is only like $13 for the hardback at Barnes and Noble. WHAT A STEAL!! I know this is more of a spotlight post, but I consider it an opinion post since I am telling you my opinion on it and I am picking what I want to talk about. So, now to get you guys more involved with these opinion posts I want to hear YOUR opinion. 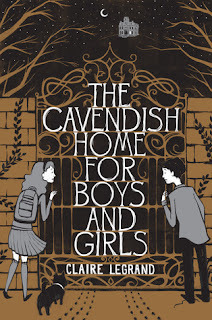 Have you already read The Cavendish Home for Boys and Girls? What did you think of it. And if you haven't read it, what do you think of it thus far? Will you read it?